Indeed, employment in food service from 2015 to 2016 was not affected, “even among the limited-service restaurants, many of them franchisees, for whom the policy was most binding,” according to the study, led by Berkeley economics professor Michael Reich. The minimum-wage law, which took effect in April 2015, raises the minimum wage gradually until it reaches $15 by 2021 at the latest. Larger employers, and those that do not pay toward employees’ medical benefits, are required to start paying $15 sooner than small businesses and those that pay the benefits. Currently, the minimum wage in the city ranges from $11 for small businesses that pay medical benefits (and/or if the employee earns $2 an hour in tips) to $15 for large businesses that don’t. 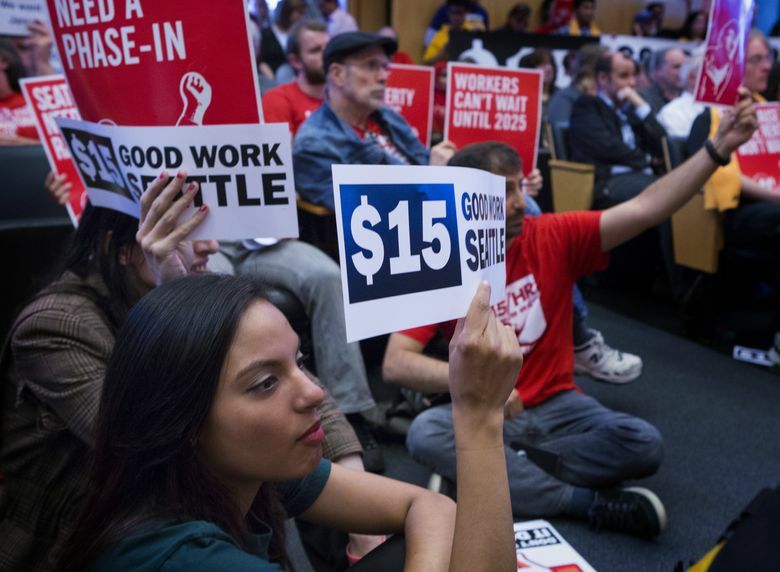 It can be hard to separate what impact the wage law had on employment in Seattle versus the effect of the city’s white-hot economy and tight labor market, but “we do our best,” Reich said. The study compares the wage and employment growth rates in Seattle to a control group of counties, in Washington state and across the U.S., that had similar growth rates as Seattle in the years shortly before the minimum-wage law took effect. The control-group counties did not have minimum-wage increases other than being indexed to the inflation rate. The counties were chosen using a computer algorithm, Reich said. A city-commissioned report by University of Washington researchers last year reached a more mixed conclusion. That study said the law indeed helped to raise the hourly pay for low-wage workers. But it also concluded that while the employment rate for such workers was better than the historical average due to the booming overall economy, the minimum-wage law itself appeared to have slightly lowered their employment rate and hours worked, relative to regional trends. Heidi Mann, who with her husband owns a Subway franchise near the Shoreline border, said she had seven employees, including her husband, two years ago. But she’s gradually had to let four of them go and is down to one full-timer, one part-timer and her husband, who’s working 60 hours a week and likely to take on more hours soon, she said. Because she’s a franchisee, her Subway is considered a big business and must pay $15 an hour. “That’s why our prices are higher than the Subway in Shoreline or the mom-and-pop shop down the street,” Mann said. She raised the prices of sandwiches an average of 86 cents to help offset the minimum-wage boost, and said she’s lost customers because of the increases. Still, others in the food industry in Seattle have been scrambling to find workers, including a restaurant owner who recently posted about desperately needing a dishwasher. Reich, of UC Berkeley, said the study is not saying that there aren’t individual restaurants that have to cut hours or let people go or close.